Your essential Canon EOS 80D camera field guide in a convenient pocketable style. This EOS Pocketbook for the 80D is a concise guide to your camera and small enough to carry with you everywhere. Nina Bailey, Technical Editor of EOS magazine and author of the popular EOS eBook series, has the solution. 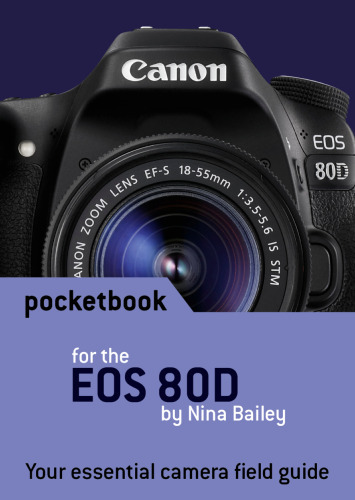 This new Pocketbook for the Canon EOS 80D is a concise guide to the most used and confused features and controls on your camera, based on Nina’s vast experience as lecturer at EOS Training Academy – hearing first-hand what photographers want to know and understand about how their EOS 80D camera operates. Very useful book for pocket or camera bag for those like myself who cannot remember all the setting variables. Not really the amount or depth of information expected. The item is over priced compared to other products. There is a printing fault that has duplicated at least one of the few pages - it could have used this rare page for additional useful information. Disappointing. Thank you for your feedback. We are sorry that you were disappointed with the book and also that there was a print error on some of your pages. We can either replace the book or arrange a refund for you.